Welcome to our second annual Veterans Day special, where we feature a really amazing Veteran with an incredible story – and a nonprofit as well, where we can help veterans who may be in crisis. 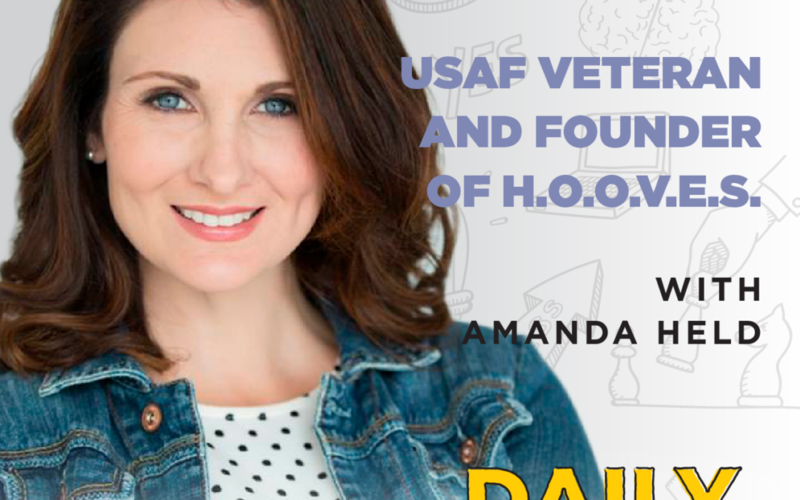 Amanda E. Held is an equine specialist facilitator, lifelong equestrian, and veteran with seventeen combined years of service in the United States Air Force and the Air National Guard. She is passionate about helping people shift their perception to live a life of radical appreciation. Amanda’s seeks to travel and teach her process to heal those who are suffering from PTSD (post traumatic stress syndrome). Her work benefits clients on both personal and professional levels, and allows them to create a life of passion, purpose, and inspiration for themselves. Amanda is the founder of H.O.O.V.E.S. (Healing of Our Veterans through Equine Assisted Services). H.O.O.V.E.S. believes that Experiential Training makes a difference for veterans, and that Equine Assisted Learning can greatly impact our service men and women. Through transformational workshops, our team works tirelessly to provide this much needed support to our service men and women. The Initial Three-Day Retreat: Veterans have a chance to leave their current environment to spend three days among fellow veterans and rescued horses to work through trauma and create a personal mission statement to take with them out into the world. Ongoing Support: Veterans return monthly to continue the process.